It is a clear liquid with a cleansing oil-like consistency. Looks so messy right? :). Cleaning them was a pain to coz Duraline made the eyeshadows adhere so well to my skin. I tried it with different eyeshadows: MAC, Maybelline & Revlon. 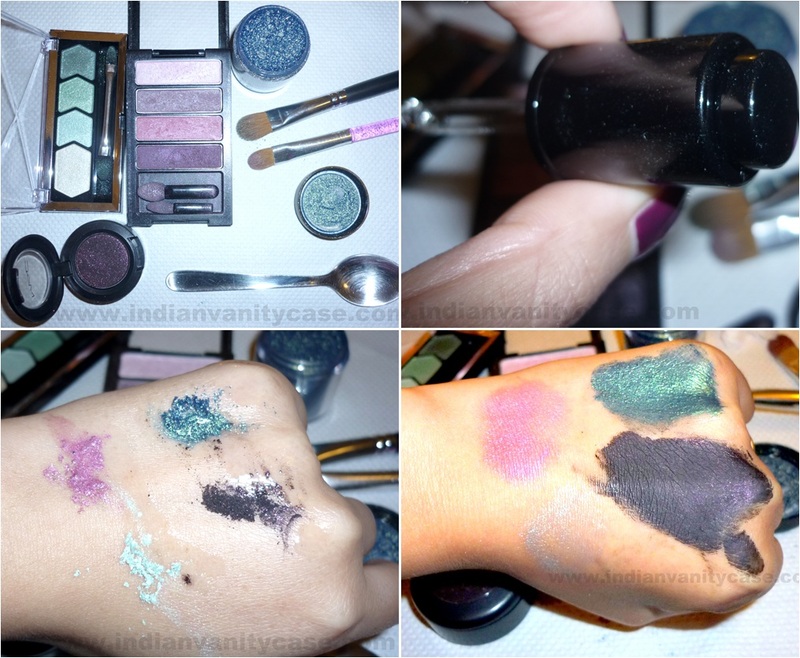 I used the spoon to scrape off the eyeshadows =D. You can press the top of the dropper (top right pic) to release desired amount of Duraline, but most times I didn't need to press it at all. You have to mix & apply quickly otherwise it will dry up before you know it. Works well with all of them (I wiped off the green one by mistake! >.<) . *By the way, it works with glitter too. The one in the top right is MAC Steel Blue pigment. 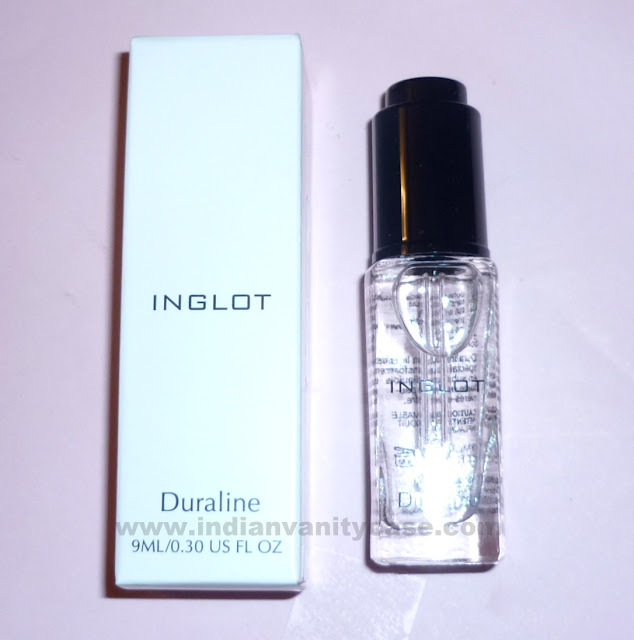 I wore it mixed with Duraline today and I was quite happy with how easy the application was-without fallouts and it didn't dull down the color and finish of the pigment. Little bit of creasing after a few hours, but creasing is usually inevitable with my eye shape especially with cream eyeshadows. It works! My gel liner is usable again! :). 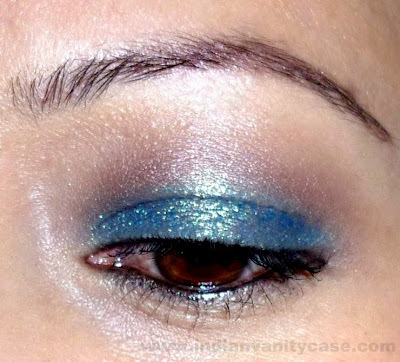 You can turn your gel liner into a cream eyeshadow or base too. Although you might have to spend more time removing the liner. It took me a while to get all that off. 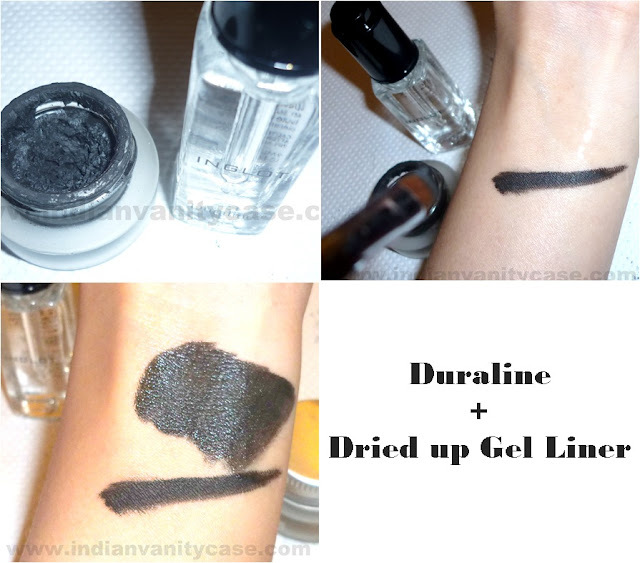 **Just don't make the mistake of dispensing the Duraline right into the gel liner jar, otherwise you will end up with even drier/hardened gel liner. It's better to mixing them on the back of your hand each time. But I won't be using it all up anytime soon coz just a drop or two is need each time, and it's not like I'll be using it all the time anyways. Priced at Rs.435.56. Actually the price on the box is Rs.490. 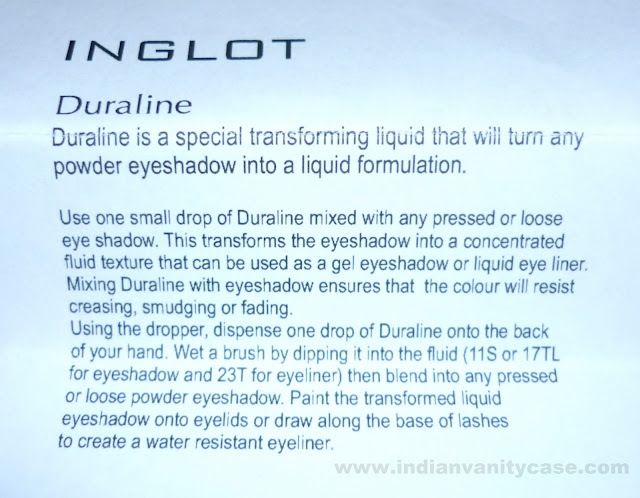 Inglot reduced the prices of most of their products for some reason. 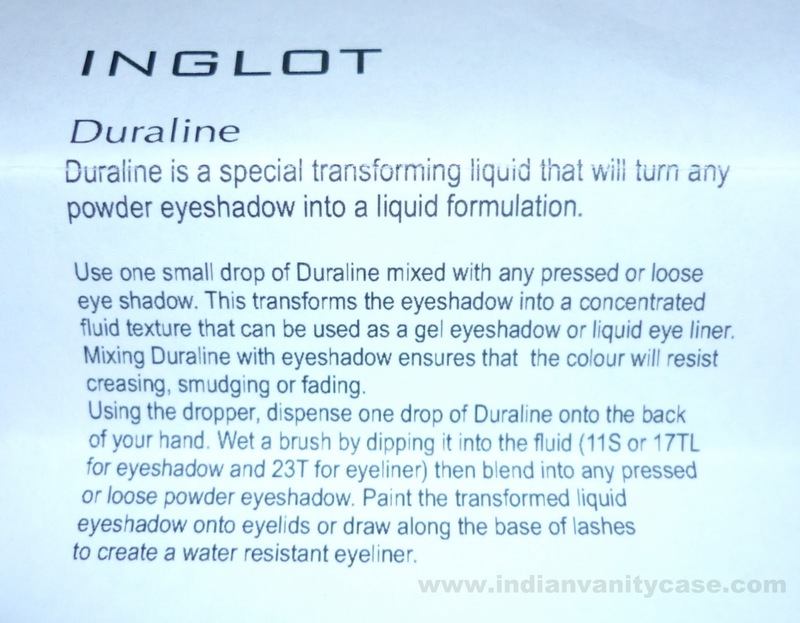 Like all Inglot products, Duraline is Paraben free & Not tested on animals. wow!cool review and a cool product. this is definitely on my list when I visit inglot next time! Def looks like an awesome product !! Wowwww that's a MUST have in any collection! 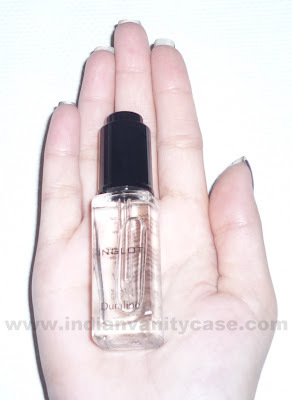 One of my much waited for trustworthy review...Thanks dear. Definitely sounds like a cool product..and an inspiration to get more eye shadows(im crazy abt eye makeup),pigments etc..wink wink. btw....how do you use this product? mix it on your hand and then use a brush to apply it on?? is it? Akshi ~ Yes, just use a flat synthetic brush to mix & apply. Anita~ Ya I've seen that...like the name. Ok lemme know if it's good. .....and is it easy to blend?? That's quite a magic product! It's so good that it can revive a dried up gel liner? Fantastic! Hey Cynthia.. as you said you had to use a spoon to scrape off the eyeshadow.. was it easily removable with a normal make-up remover? Hey Cynthia.. as you said you had to use a spoon to scrape it off.. so were u able to remove the same with a normal makeup remover?